Oracle Open World is almost upon us and as ever I have a full dance card. 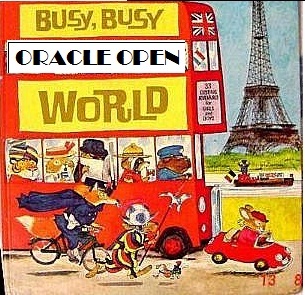 I was looking back at previous years, 2011, 2010, 2009, 2008 and as Richard Scarry says it is a Busy, Busy (Oracle Open) World. You would think having stepped down as UKOUG President I would have time on my hands, but no I still have as much to do. Fujitsu are the Global sponsor which means I am presenting one of our four regional showcase sessions. I am talking about Consolidation and Managed Shared Services in a very large organisation. It is a great case study and one I have really enjoyed working on. If you have any interest in the business benefits of what technology can do, come along to this session. I have another session on Consolidation of Wednesday, in fact the last session of the day which is ideal and I promise it will not be the full 60 minutes. It is a light hearted look at the concept of Consolidation, the story of how I consolidated my handbag with my smart phone, and how the same principles refer to business. I was given this slot as the presentation was voted in the top 10 EMEA user group submissions. I gave it for the first time at last years OOW and it was my highest scoring session, probably because it is just pictures! Three sessions and I haven’t even mentioned the ‘F’ word yet. This is why I love my job. Fusion Applications woke me up to the fact that there is no business solution without technology, but the reverse is true as well. If you work with technology you need to know the business use for it, after all they make the investment. Consolidation and Cloud are other technologies but the same applies. I don’t teach you how to do something, just why you might. But Fusion Applications are my sweet spot and I am proud to be kicking off the ODTUG Fusion Symposium on Sunday with John King with a setting the scene session on Fusion Technology. Then on Wednesday I have been asked to join Jeremy Ashley VP of User Experience in his session, if you still haven’t looked at how Oracle approach user experience then you need to attend this. And between these I want to get to as many customers talking about their adoption of Fusion Applications, and talk to some of our customers from around the world who are considering it. 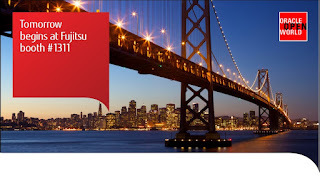 Drop by the Fujitsu booth (1311) and talk to my colleagues, give them feedback on my presentations especially if you like them and tell us what else you would like to hear about. We are proud to be Global sponsors and hope you enjoy the Opening and Appreciation events and will say thank you by attending our keynote (Sunday evening) and executive sessions. But OOW doesn’t start on Sunday for me it starts the week before at Redwood Shores, where I am training with the Fusion Applications User Experience Advocates group, which is a subset of the ACE Director Program who has their annual briefings on Thursday and Friday. I also need to fit it various partner, blogger, twitter and ACE events, another Oaktable party, daily Chi Gung and some swim Oraclenerd is arranging during the week and going along to the User Group Pavilion to encourage participation. If you see me running about, stop me, I will always find time to say hallo .